Imagine it's a hot, sweaty summer's day. You've been running jet fighter drills all morning long, heat rising in shimmering waves from the tarmac. Maybe you took a break to play a game of volleyball with the guys, pushing your well-muscled, shirtless, perspiration-slick body to its very limit. Afterwards you slip on your aviator glasses, hop on your motorcycle and drive to your comely instructor's home. Parched, you reach into her fridge for a cold drink. You pop the cap and take a long, thirsty swig. It tastes like burnt pig. What do you do? What? Do? You? Do? Me? I'd throw up all over Kelly McGillis. Then I would contact Chris, the guy from the Rocket Fizz Soda Pop & Candy Shop who thought I might like to try something called Lester's Fixins Bacon Soda, and I would ask him why? I would also ask him why I am suddenly Tom Cruise in Top Gun, but only after I got to meet Kenny Loggins. Bacon is one of the two flavors sent to me by the fine folks at Rocket Fizz, a four-year-old establishment that's got locations dotted all across the Southern portion of the country. I'd heard about them before — in fact I may have contacted them in the past, inquiring into some of their more colorful flavors — Sweet Corn and Buffalo Wings, if I remember correctly. As fate would have it, before the company could respond to my inquiry, Chris reached out with a couple of bottles of Bacon and Peanut Butter & Jelly, and I accepted them, because sometimes I am incredibly naive. Or maybe I just love bacon. I know it's a meme, I know it's been played out, but that doesn't make bacon any less delicious. I cannot recall a single moment in my life where I have turned down strips of pig back and sides. "Would you like more strips of pig back and sides, Mr. Fahey?" they'd ask, and I would reply, "Mr. Fahey is my father, good sir. Now fill my plate with more bacon, post-haste!" I say things like post-haste all the time. And good old belly-bacon? They don't even have to ask. And is there any better combination than peanut butter and jelly? How about peanut butter, jelly, and soda? Everyone loves peanut butter and jelly. Everyone loves soda. Why not mix the two? And hey, Everybody Loves Raymond. We should slather him with ground peanuts and fruit preserves and trap him in a giant bottle and smile as he screams in that froggy, throaty voice of his. And could you pick a less attractive picture of a sandwich? That looks like a proctologist's nightmare. Also, as the observant among you have no doubt already noticed, the Lester's Fixins Peanut Butter & Jelly soda is pink, suggesting strawberry jelly, while the label shows either grape jelly or leftover props from a George Romero zombie movie. Will there be a flavor discrepancy? Let's find out. Note: This video represents my very first taste of both of these flavors. I apologize in advance for any profanity or blasphemy that might arise from this candid video. Obviously, Omega Supreme was completely useless. Oh stop pouting, you big baby. Bacon Soda: It tastes like burnt bacon steeped in weak cream soda, a snapshot of two incredibly delicious things at their absolute worst, in your mouth. Peanut Butter & Jelly Soda: Have you ever had that old-fashioned peanut chew candy from like, 1947? The peanut element here tastes a bit like the echo of one of those, long since dead. The fruit — leaning towards strawberry, as confusing as that is — is barely noticeable. There's really hardly a flavor present, but the one the taste hints at is ominous, foreboding, and vaguely fruity — coincidentally the exact words I want carved on my tombstone. In sending me these two bizarre flavors of soda, the Rocket Fizz Soda Pop & Candy Shop have done an incredibly brave thing. What they should have done was land that plane. They don't own that plane! And maybe they should have sent along a normal flavor to create a baseline, so maybe I could get where these two were coming from. Instead they've been writing checks the body of their beverages can't cash. They're on a highway to the danger zone. Snacktaku is Kotaku's take on the wild and wonderful world of eating things, but not eating meals. Eating meals is for those with too much time on their hands. Past critiques can be found at the Snacktaku review archive. 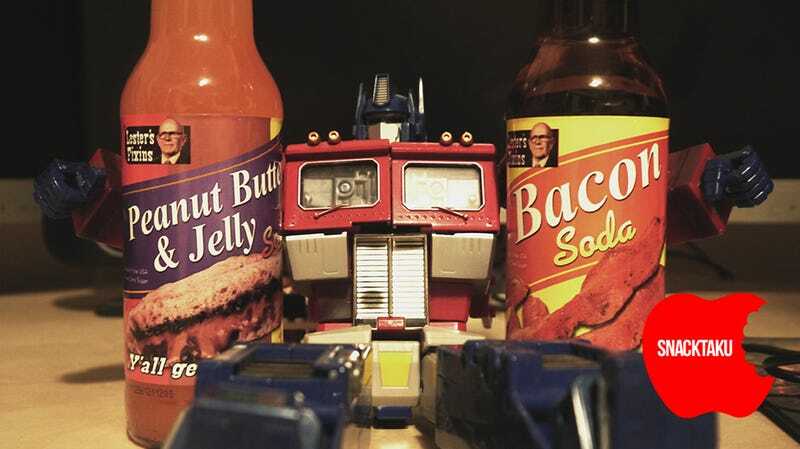 Fahey will never explain why Optimus Prime is in the top photo, so stop asking.